Journalists look for hooks to hang their stories on, and anniversaries of major events are always convenient pegs to use. On the 50th anniversary of the Korean War I profiled the combat experience of Bill Ramsey, an amiable man who made a rich life for himself after the conflict as a husband, father, PR professional, and community volunteer. He has devoted much of his life to veterans affairs, particularly memorializing fallen veterans. He’s also authored a handful of books. He’s still quite active today at age 80. Anyone who survives combat has a story worth repeating, and it was my privilege telling his story in the New Horizons. Now, in conjunction with the 60th anniversary of the Korean War, I offer the story again as a tribute to Ramsey and his fellow servicemen who fought this often forgotten conflict. Fifty years ago, Americans were piecing their lives back together in the aftermath of World War II when the best and brightest of the nation’s youth were once more sent-off to fight in a distant land. This time the call to arms came in defense of a small Asian nation few Americans were even aware of then — Korea. In June of 1950, Communist North Korean forces (with backing from the Soviet Union and Red China) launched an unprovoked attack on the fledgling democratic republic of South Korea, whose poorly prepared army was soon overrun. With North Korea on the verge of conquering their neighbors to the south, the United States and its Western allies drew a line in the sand against Communist expansionism in the strategically vital Far East and led a United Nations force to check the aggression. Among those answering the call to service was a tall, strapping 20-year-old Marine reservist from Council Bluffs named Bill Ramsey. His wartime experience there became a crucible that indelibly marked him. “The war will always be the most defining experience in my life,” said Ramsey, 70, whose full postwar years have included careers as a newsman, advertising executive and public relations consultant. He and his wife of 46 years, Pat, raised five children and are grandparents to 14 and great-grandparents to one. This is his Korean War story. In the fall of 1950, Ramsey was preparing to study journalism at then Omaha University. His plans were put on hold, however, with the outbreak of hostilities overseas. He followed the unfolding drama in newsreel and newspaper accounts, including the U.S. rushing-in army divisions grown soft from occupation duty in defeated Japan. 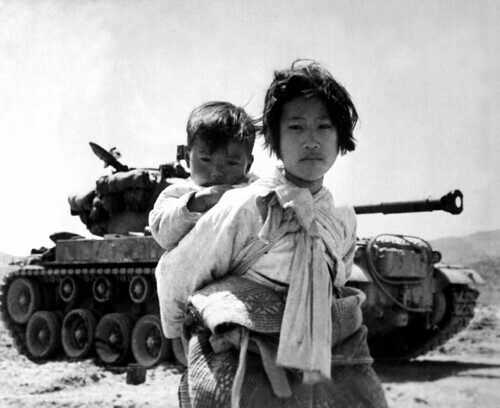 The invaders pushed South Korean and American forces down the Korean peninsula. Ramsey sensed reserves might be recalled to active duty. He was right. He was assigned a front line unit in the 5th Marine Regiment, 1st Marine Division, Reinforced. He was excited at the prospect of seeing action in a real shooting war, even one misleadingly termed “a police action.” His anticipation was fed not by bravery, but rather heady youthful zeal to be part of the Corps’ glorious tradition. The conflict offered a once-in-a-lifetime opportunity to test himself under fire. After all, he was too young to have fought in his older brother Jack’s war the previous decade. This would be his war. His proving ground. His adventure. No stirring salute or fanfare saw the Marines off as their Navy attack transport ship, Thomas Jefferson, pulled out of San Diego harbor in March 1951. Ramsey was one of hundreds of young men crammed in the hull. They had been plucked away from factories, offices, schools, homes and families. Ramsey left behind his mother, brother and an aunt (his father died when he was 12). The GIs were going to defend a land they did not know and a people they never met. Their mission lacked the patriotic fervor of WWII. There was no Pearl Harbor to avenge this time. No, this was a freedom fight in a growing global struggle for people’s hearts and minds. Ramsey and his Able Company comrades were flown into a staging area near Chunchon in east-central Korea to await transport to the front. The city had sustained heavy damage. “It was pretty well leveled at that point,” he recalls. Standing on a wind-swept tarmac, he saw snaking down a road from the north a convoy of trucks carrying combat-weary GIs being rotated out of the line. These were veterans of the famous Chosin Reservoir Battle who defied all odds, including numerically superior enemy forces, to complete a withdrawal action that featured hand-to-hand combat. Ramsey and his green mates were their replacements. Ramsey’s unit headed for a position along the central front. Every village and field they passed was scarred and charred. “We drove all night. We could see fires burning. Again, we could smell the countryside,” he said. Sometimes, a noise from somewhere out in the pitch black warned of encroaching danger. Other times, a fire fight broke loose with no warning at all. “You would hear something or you would sense something. You laid down fire if you heard anything at all out there. Their movements might trigger a flare, which made it easier for you to see them moving but also made it easier for them to see you,” he said. “On occasion, they would purposely make some noise to try and shake you up. They would produce some tinny sound or blare a bugle or just shout out. It was a psychological ploy.” A dreaded eerie sound was the “zzziiippp” made by the infamous Chinese burp gun, an incredibly fast-firing tommy gun-like weapon. Perhaps the most terrifying action he saw came the night his outfit’s position was nearly overrun. What began as a cold damp day worsened after sunset. There were casualties on both sides. Ramsey said the enemy took advantage of the night, the rain and his unit’s complacency. “They knew Americans were not that big on night fighting and that with the bad weather we might be more inclined to worry about staying dry than steeling for attack. I think what happened is somebody in our ranks did let down. That was the only time they got in our camp that way.” He said an enemy breaching the wire could “demoralize” the troops and, if not repelled, result in a much larger breakthrough. He described “plenty of close calls” on Able Company’s grueling march north across the 38th Parallel to engage the Chinese in the Iron Triangle stronghold. There was the omnipresent threat of mortar and artillery fire. If you stayed in the field long enough, he said, “you could hear the difference in the sound” and distinguish mortars from artillery and what size they were. Where a mortar round or artillery shell whistling high overhead gave men time to find cover, the report of the Chinese mountain gun, which fired shells in a low trajectory, allowed little or no time to hit the dirt. “You heard the report and, BOOM, it was right there. It fired in on like a straight line.” And there was occasionally the danger of friendly fire, especially errant air strikes, raining hell down on you. Fording the streams that flowed abundantly from the mountains in Korea presented still more hazards. As heavily weighed down as the men were with their poncho, pack, boots, rifle, helmet, and ammunition, one slip in crossing the clear, fast-rushing streams (more like surging rivers) could be fatal. “A few times I felt like I was going under for sure,” Ramsey said. “I wouldn’t have had a chance.” Carrying their rifles overhead to keep them dry, the men were sitting ducks for snipers. “We were exposed,” he said. On the morning of November 17, his fire team “headed out on a routine sniper patrol” down Hill 834. “It was one of our more permanent lines. The hill was a muddy mess. We weren’t out long when one of us tripped a land mine, and a piece of shrapnel caught my right arm.” The impact sent Ramsey skidding face down the hill. “I was in shock, but I knew it was pretty bad because my dungaree jacket was shredded and blood was all over the place.” Metal fragments had severed his ulnar nerve and fractured bones. His mates brought a Navy corpsman to his side. The corpsman applied a bandage and administered a shot of morphine. Ramsey’s buddies then carried him up the hill and down the reverse slope to a small, level clearing. There, a second casualty from down the line was stretchered in — missing a foot. Ramsey recalls an officer giving him a cigarette to drag on and saying, “You got a million dollar wound there, Bill…you’ll probably be going home.” Still, Ramsey worried he might lose his shattered arm, which burned with pain. A helicopter evacuated he and the other casualty to a nearby MASH unit. Rushed into surgery, Ramsey awoke the next day to the news doctors had saved the arm. Wearing a cast, he was taken (by ambulance) to an Army hospital in the devastated capital of Seoul. “There was nothing standing,” he said. From there, he was flown (on a transport plane stacked with wounded) to an Army hospital in Osaka, Japan, spending days in agony (receiving no treatment as a non-Army patient) before transferred (via train) to a Navy hospital in Yukosuka, where he finally found some relief for the pain and slept for the first time in nine days. In early December he hopped a four-engine prop bound for the states. He landed at Travis Air Force Base in southern California. His first impulse was to call home. He next reported to Oak Knoll Navy Hospital near Oakland, where he underwent skin grafts and three months of physical therapy. During his rehab, the Purple Heart recipient recalls being torn by two emotions: “I felt sick about leaving and letting my buddies down. But the other side of it was I was really thankful to get out. Eight months there was enough.” His long voyage back ended almost a year to the day his Korean odyssey began. A relieved Ramsey arrived to “the quiet of my wonderful home.” He downed a beer and thanked God the journey was over at last. Upon his return (he graduated from Creighton University) he was dismayed by the indifference civilians expressed toward the raging conflict. From its start in June 1950 to its conclusion three years later, it never captured the public’s imagination. Many observers feel it came too quickly on the heels of World War II for Americans — then preoccupied with living the good life — to care. Cloaked under the murky misnomer “police action,” it became a shadow war. It is only recently, however, these veterans got their due in America. 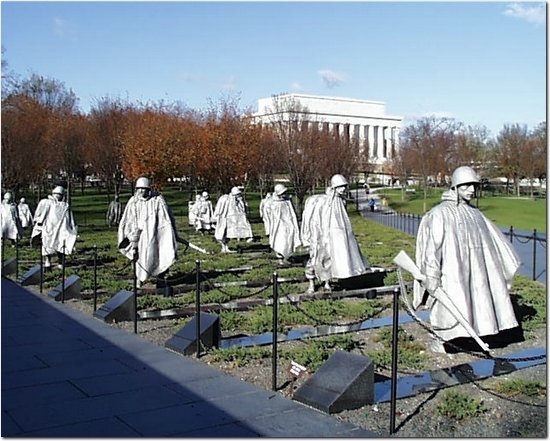 In 1995 the Korean War Memorial was dedicated in Washington, D.C. (Ramsey was there). In the late ‘70s Ramsey, whose post-war life has been devoted to causes, spearheaded the erection of a joint Korean-Vietnam War monument in Omaha’s Memorial Park. The monument has received a recent refurbishing and the addition of a flower garden. This year, he started a Nebraska chapter of the National Korean War Veterans Association. For vets who went to hell and back, the war is never far from their thoughts. “I’m proud to have served. We stood fast. We saved the south. I can think of no higher compliment than to be called a freedom fighter,” said Ramsey, who, in 1997, faced a new enemy — prostate cancer. Aggressive treatments have left him cancer free. In August, he attended a reunion of his 1st Marine Division mates. “My admiration continues to grow for the Marines with whom I served,” he said. For their heroic actions there, the division received the rarely bestowed Presidential Unit Citation.